I always start the new year with the best intentions. I'll be super neat (and sweep the bathroom floor before the hair balls start looking like tumbleweeds)! I'll go the gym (instead of giving it the side eye as I quickly run in to Starbucks). And most importantly, I'll cut out fast food (including my beloved Taco Bell)! One by one the resolutions fall to the wayside. I mean, Let's be honest, the gym resolution didn't ever stand a chance in the first place. But the "less fast food, more real meals" resolution? That one is always the most important one and tends to stick around throughout the year. So when I was paired with Lea Ann for this month's Blogger CLUE challenge, I was super excited to find more real food inspiration. Lea Ann is the dynamic powerhouse behind the blog, Cooking on the Ranch, and her recipes are the perfect blend of healthy and hearty. January's Blogger CLUE theme was something sparkly. Think champagne, sprinkles, edible gold leaf. Sadly, our entire family spent the first few weeks of the year being super sick and not feeling very sparkly at all. We were, however, definitely feeling ready for a warm and comforting meal. 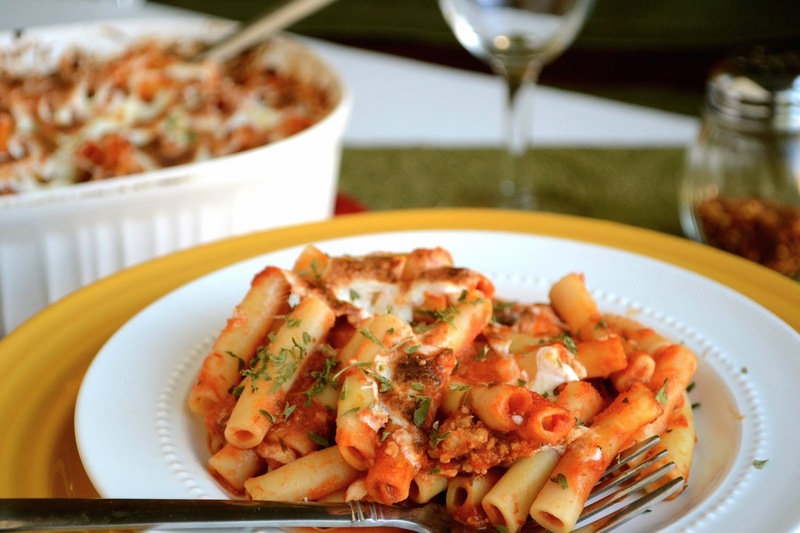 So I scoured Lea Ann's blog and came across her delicious looking Baked Ziti. Lea Ann used fire roasted tomatoes for that little something extra along with a zucchini for a bit of extra heft. We didn't have any zucchini and I figured the kind folks at my grocery store didn't really want to see sniffly me in my pajamas, wandering in a flu medicine haze through the produce section. But in keeping with the theme, I did sprinkle some sea salt crystal on the dish for the sparkly quotient! My family does not have any Italian genes but this is definitely a meal to bring out the Italian in you! A giant one dish meal, heaping with hot pasta, meat, sauce, the all important cheese, it's basically comfort in a bowl. Oh, and it makes enough to last for a few meals (well, unless your family is like ours and they came back for seconds and thirds). Then, it's only enough for one meal and a few cold leftover spoonfuls at midnight. Happy new year y'all! Here's to more good eats in 2015. And heck, maybe I'll even go the gym this year. On second thought, why mess with a good thing. Heat oven to 375°F. Cook and drain pasta as directed on box. Meanwhile, grease one large baking dish with oil. In a large nonstick skillet, brown onion and garlic. Add ground beef and cook completely. Stir in tomato sauce, tomato paste, water, and oregano. Heat beef and sauce mixture to boiling. Add cooked pasta and toss to coat. Spread in prepared baking dish. Cover dish tightly with foil; bake 20 minutes. Remove foil; sprinkle with mozzarella and parmesan cheese. Bake uncovered about 5 minutes longer or until cheese is melted. Broil for 4-5 minutes until cheese is browned. Thanks for the kind words. And great selection for a comfort meal. I need to make that again so I can get a photo that's as good as yours. Hope you're feeling better, and if you think about it "fire roasted" counts as sparkly….don't you think? Nice cooking with you for our January event. This was a great recipe, thanks for sharing it Lea Ann! I can't wait to cook with you again next month! The ziti looks wonderful and I hope you and your family are well on the mend now. What a beautiful, wholesomely satisfying dish! I'd go back for seconds and thirds too! This ziti looks fantastic! Love a good cheesy pasta dish! It's the perfect comfort meal especially when the weather is chillier. Hope you are feeling better and Happy New Year, Azmina! Thanks Kelly! And cheese and pasta just go so well together right?! Happy New Year to you and your family as well! YUM! Perfect comfort food! Hope you're all feeling better!!! Thanks Liz. We're so much better and I'm hoping we're able to keep the germs away for a good long while! Wonderful choice Azmina! I bet there was not a drop left in the pan. It was so fun to have you this month and look forward to seeing you on Saturday!! Thanks Lisa! I was glad you were assigned my blog this month and it was lovely to see you this past weekend. This looks fabulous! Hope you're on the mend. Thanks, Kimmie! We're all much better. The pasta probably helped. Hope to see you soon! You did the Italians proud. This looks delicious! We started off the New Year sick as dogs as well so I know the feeling. Looking forward to seeing you on Saturday! That's such a nice thing to say especially since your Italian food is the real deal! So great to see you this weekend! I'm freezing right now and all I want to do is go home and cuddle up on the couch with a giant dish of this!! It's definitely stick to your bones cold weather food! Hope it warms up for you soon! This baked ziti looks good - any dish that brings out the Italian in someone who didn't have any to start with has gotta be ah-mazing! My family loves baked pasta...although mine never looks as tasty and authentic as yours!! And THAT is exactly why I don't make resolutions (save myself the grief). ;) This Ziti does sound like pure feel-good food. Wise choice indeed, Heather! Looking forward to cooking with you next month! Yummy comfort food!!! And, yes, the salt does count. As long as you allow the sugar on mine to count... I couldn't pass up my great grandkids option for something more sparkly. I'm so sorry that you guys have been sick! I hope you'll all be on the mend sooner than later and that will be all for this winter! Sending good vibes your way. I'd have picked that baked ziti too, Azmina. It looks absolutely delicious and totally like the perfect comfort food meal. The Baked Ziti looks gorgeous - great food to recover with. We are definitely trying to stick to less (or no) fast food, and healthy meals at home - recipes like this sure make it easier! Hope you are feeling better. Happy New Year! 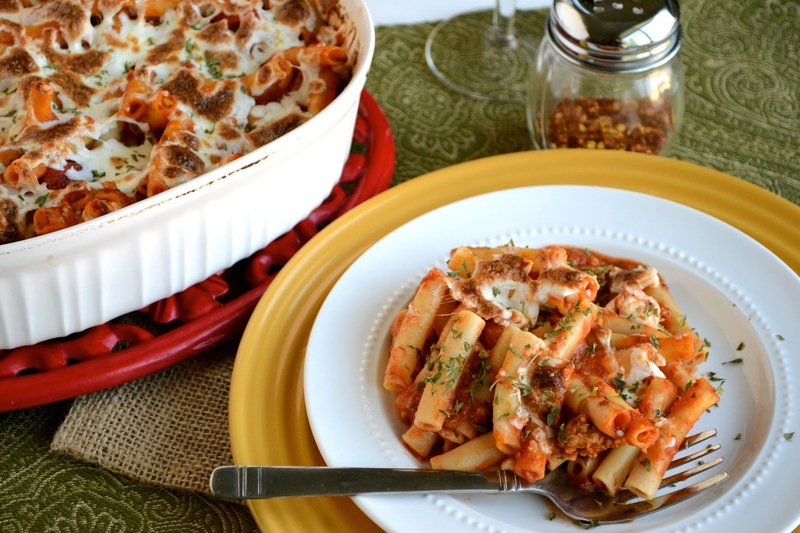 Baked ziti is definitely warm and comforting. One of our faves! Looks scrumptious.